Oven baked tandoori chicken sandwich for an Indian-inspired lunch for everyone craving tandoori chicken. This quick fix will not only fill your craving but keep you full for a while. 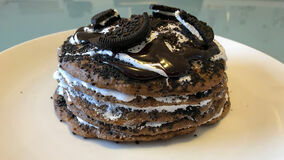 A classic home recipe that made for an amazing breakfast. 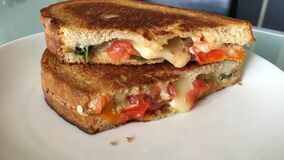 This modern rendition of my mom's spicy grilled cheese has mozzarella, tomatoes, onions and chillies, cozied up between two slices of toasted rye. Your classic chocolate chip pancake enhanced with swirl white and semi-sweet chocolate chips, coated in a rich and creamy peanut butter sauce! Perfect for an epic breakfast! Fresh, creamy, tangy and little bit spicy. For anyone who loves avocado, this is my favourite recipe to enjoy with my breakfast bagels, tacos, fajitas, and chilli. Is ready in minutes and stays refrigerated for 3-4 days. A light and fluffy homemade wrap stuffed with roasted deli turkey and cheese and cooked until molten. Full of fresh tomatoes, guacamole for a creamy, protein filled lunch. This power bean burger will get your hunger going! Delicious, rich and spicy patty of red kidney beans, black beans with mushrooms, onions, garlic and spinach. Served over butter toasted burger buns, fresh tomatoes, lettuce and avocado. This recipe is to make the softest fresh homemade paneer. Patience is key but it is well worth it to enjoy with your favourite vegetarian curries! This is a meaty and hearty chilli made with ground beef and red kidney beans prepared in the Instant Pot. The magic comes from the California chilli paste, which brings immense smokiness to the chilli. A recipe for a grilled chicken burger that is extremely juicy and packed with flavour! Learn how to make the marinade and grill this chicken to perfection, and add your favourite toppings.